This autumn, mk2 will inaugurate mk2 Store, a concept store to cultivate a cinema-inspired lifestyle. Housed on the ground floor of the mk2 Bibliothèque cinema, this 700-square-meter space, bathed in natural light, provides a whole new experience for its visitors. Designed by the agency Cigüe, the concept store offers a unique selection of objects that extend the experience of cinema to the realms of living well and creative design. mk2 has appointed creative director Clarisse Demory to curate a selection of items ranging from culture, fashion, beauty, tech and lifestyle. Every detail reflects the high standards for cinema that mk2 has held since its inception in 1974, making the venue a world-class address. 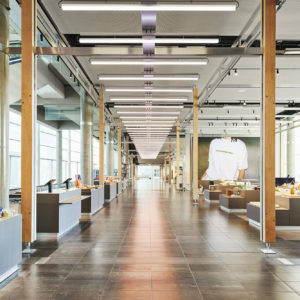 The concept store, with its warmth and light, is a place to browse and explore. It includes a lifestyle boutique, a bookshop with an adjoining restaurant, Bob’s Café, as well as a section for techies both large and small. One thing that’s impossible to ignore: the candy carousel and its eighty flavours. Whether it’s a postcard showing an iconic scene from film history, the stunning Teenage Engineering OD11 connected speaker, or the softest cashmere blanket to cuddle under while watching a DVD, every aspect of the store has been carefully chosen with taste and cinematic flair. It also highlights iconic objects from films or those that evoke cinema such as the Eames LTR table by Vitra, seen in Beginners by Mike Mills, or the Cesta lamp by Miguel Mila (seen in Broken Embraces by Almodóvar). The culture section, with its fine range of print media, also includes a collection of vintage cinema books, rare vinyl, and a tightly-curated selection of DVDs. The space revolutionises the district’s booming commercial landscape (with Station F, the Agnès b. Foundation, and more), creating the first shop where people will come to find inspiration. Imagined as cultural space in its entirety, the selection of objects will change every season to reflect the themes of mk2’s cultural programming, which includes masterclasses, signatures and workshops. This collective of architects creates interiors that get back to essentials while injecting industrial materials into the mix. Prior to designing shops all over the world (Aesop, Études Studio, the pastry shop of the Meurice hotel), these DIY enthusiasts started off by opening their own carpentry workshop in Montreuil. For mk2 Store, they have created an impressive floor-to-ceiling structure made of aluminium and solid maple that holds up a set of translucent hi-tech curtains. Movable walls provide material substance, play with light, and round off hard corners as much as they delineate the spaces within the concept store. The creative director of mk2 Store creates space for fashion and design within a cinephile world. She has given the concept store a unique character, from the rigorous selection of objects to the way they are staged. The press has been following her closely (Monocle magazine having classed her in their “Top 50 in Style”), and brands and creators have used her to convey a sense of poetry in their presentations (Lemaire, A.P.C., Maryam Nassir Zadeh, among others). Her arrangements respect the nature of the spaces they are in. Her sensitivity to sounds and scents elevates her to a creator of overall experiences that are both casual and sophisticated. 1024 has been bringing its augmented architecture to spaces throughout the world since 2008. Their structures, which incorporate video, light and computer wizardry, have earned them international recognition. For mk2 Store, the duo have created a suspended carpet of LED lights ranging from lunar white to the warmest white. A rectilinear, futuristic 58-meter-long vector consisting of 77 two-metre-wide LED bars wide will light up according to various changing programs. This tribute to the City of Light will accompany the audiences wandering through the heart of mk2 Store. Collages of pre-existing music interspersed with film dialogue samples. “Words that strike you while you’re on the go” is how the sound designer Cédric Marszewski (a.k.a. Pilooski) conceptualised the sonic environments of mk2 Store. One for the day that’s full of energy without being invasive. The other for the evening: calmer, sensual and dreamlike. Both playlists will change to accommodate new themes and his creative discoveries. In addition to working on fashion and advertising (Lemaire, Hermès, Bonpoint), this jack-of-all-trades has developed projects with the artists Baxter Dury, Jarvis Cocker and Simon Liberati. Located on rue Chabanais, the creative studio led by Franck Durand has created images for campaigns by Isabel Marant, Anthony Vacarello, de Fursac and more. The Parisian agency, which spearheaded the renaissance of Holiday magazine, the Holiday Café, and the Holiday Boileau shop fully understood how to embody the spirit of the project by adding an elegant touch to its visual identity. After growing up on the Upper East Side and studying cinema at Harvard, Marc Grossman moved to Paris. The New Wave enthusiast decided to live out his passion in the City of Light. But it was through observing the Parisian appetite for street food that he discovered a new vocation. In 2010 he opened his first juice bar. Its American touch led to quick success: Marc Grossman would go on to open many more of these atypical, healthy spots. Located next to the bookstore, Bob’s Café mk2 Store is the latest treat for the movie buff. Visitors will be able to enjoy the reasonably-priced, home-made food while comfortably seated at large maple tables. Bob’s Café: 9:30 a.m. – 10:30 p.m.
A symbol of auteur cinema from around the world, mk2 is a family company founded in 1974 by Marin Karmitz and led today by his sons Nathanael and Elisha Karmitz. mk2 promotes quality cinematography and creates places to live and create in. As the leading art house and independent cinema network in Europe and the third largest Parisian cinema chain, mk2 operates 26 cinemas in France and Spain and hosts nearly 10 million viewers each year. Opened in 2003 next to the French National Library in the heart of the “New Latin Quarter”, mk2 Bibliothèque is currently the third-largest Parisian cinema, with 1.8 million admissions per year, 20 screens and nearly 3,500 seats. Several renowned designers have contributed their originality and know-how to the layout of mk2 Bibliothèque, including Jean-Michel Wilmotte, Martin Szekely, Jacques Bobroff, Martial Raysse and Sonia Rykiel. Designed as a place for living and meeting, the complex also contains a concept store, two restaurants, a bar, and up to eight food trucks on the plaza in front. In 2016, as part of its constant exploration of new forms of expression and culture, mk2 inaugurated the first virtual reality room in Europe, the mk2 VR, at the tip of the mk2 Bibliothèque. A pillar of the cultural establishment in the east end of the Left Bank, mk2 Bibliothèque is at the heart of Paris’s Quartier 3.0, a cultural and economic hub undergoing rapid change.